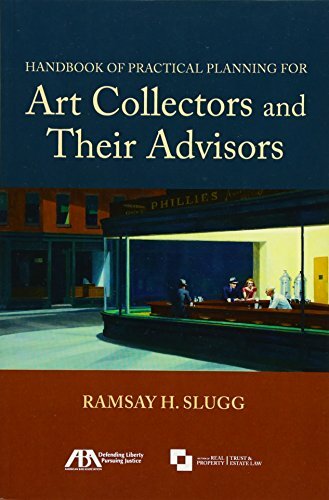 Art is an asset of passion, as author Ramsay H. Slugg begins this invaluable resource, yet it has unique and not unimportant financial characteristics. These elements make art possibly the most difficult asset to incorporate into an overall estate and financial plan. Handbook of Practical Planning for Art Collectors and Their Advisors addresses two essential elements of art ownership: planning for the ultimate disposition of the art, including how to represent the wealth represented by the art into any estate and financial planning, and the practical considerations for collectors as they collect and plan for the art's eventual disposition. After a brief discussion of the art market, the author introduces a client-focused process to use when advising art collectors. This includes explaining the income, estate and gift tax consequences of various options as well as the important and often emotional non-tax considerations of collecting and disposing of art. Particular attention is given to the charitable solutions available as these are often especially appealing to many collectors and their advisors. In addition to enlightening case studies, Handbook of Practical Planning for Art Collectors and Their Advisors considers the roles of other advisors involved in these decisions. This guide is written to appeal to all levels of knowledge, and accessible not only to trusts and estates professionals, but also for the collectors themselves as well as the many other professionals involved, including art advisors, risk management advisors, valuation advisors, and financial planners. If you have any questions about this product by American Bar Association, contact us by completing and submitting the form below. If you are looking for a specif part number, please include it with your message.